Indiana cabins are plentiful and rich with history. Enjoy a family day visiting a cabin in Indiana or be inspired to build your own! The spiritual Harmonist community was founded in 1814 by a group of 800 Pietists from Wurttemburg, Germany. 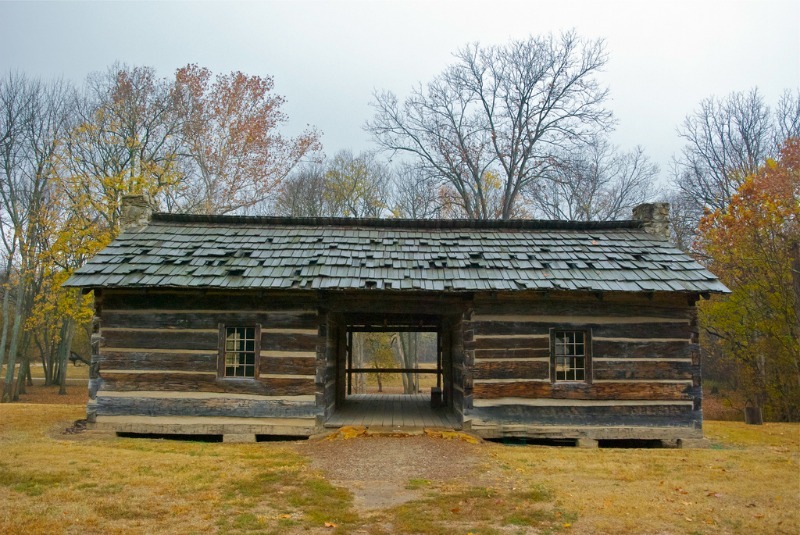 Harmonist log cabins were called "block houses" because they were made with square timbers of oak or poplar. For their log cabins Harmonists used a mud-clay mixture along with straw, wood chips, and river shells to provide insulation between the timbers They connected the logs by mortise and tenon joints, and anchored the parts by driving kiln-dried hardwood square pegs into round holes in the poplar framing. With the passage of time and exposure to moisture in the atmosphere, the pegs would expand to assure a tight fit. You can see two cabins of this style plus the entire Harmonist historical community. Brown County Log Cabins With a small ticket price that goes towards local fundraising, you can join this tour of privately owned Indiana cabins. Indiana Dunes National Lakeshore Log Cabin This cabin in Indiana on the shores of Lake Michigan was featured in the Chicago World's Fair in 1934. Richmond Log Cabin Wayne County Historical Museum near the Eastern Sate line in Mid-Indiana has exhibits that include two log cabins of local origin, period clothing, furniture, portraiture, a genuine Conestoga wagon, a blacksmith shop, print shop, bakery, loom house, a superb collection of early Richmond made automobiles, steam powered tractors, the first Davis airplane manufactured in Richmond in 1929, and a whole lot more. Lincoln City Log Cabin The Lincoln Boyhood Living Memorial in southern Indiana is a re-created pioneer homestead with a cabin, outbuildings, split rail fences, farm animals, vegetable and herb gardens and field crops. Rangers in period clothing perform a variety of activities typical of the 1820 era. Rochester Log Cabin Fulton County's Living History Village is called Loyal, Indiana, for a little village that used to exist a few miles west of the museum. Originally named Germany, Indiana, the people changed the name to Loyal in 1918 when the U.S. was at war with Germany. The village has many buildings including a pioneer woman's log cabin and a round barn. Rome City Cabin The Gene Stratton-Porter Cabin, built using white cedar logs and redwood shingles, is near the Michigan border. This was the home of the famous author of the Limberlost books. Guided tours of the Porters' log cabin are available. There is some really cool stuff inside the cabin. The bookshelves are filled with books from Gene's personal library, and the antique McCray icebox refrigerator has just been packed with a new block of "ice", giving the cabin the same look and feel it would have had when the Porters lived there. Mauckport Cabin The Squire Boone Cavern less than forty miles from Louisville, Kentucky features a historic village with a log cabin gristmill built by Squire Boone in the early 1800's. The mill has been restored and is again grinding grain just as it did nearly two centuries ago. You can watch as the 18 foot wheel, powered by water flowing from the caverns, turns the 1,000 pound grinding stones. You can even buy some of the freshly ground cornmeal! Vermillion County Cabin Skinner Farm Village near Perrysville is a collection of original Indiana cabins, buildings, round barn and artifacts which represent over 150 years of local Indiana history. A family runs it as a working farm and they sound like quite a bunch! Do you know of any special Indiana cabins? Share your Indiana log cabin adventures or invite people to see your historic site! Please use your own words. Do NOT copy and paste more than a short quote from any website.